Batangas is claimed, by many, to be one of the best locations to go to in the Philippines if you’re into ‘drop dead’ gorgeous beaches – other resorts would, of course, contest that claims, but having to some of these other resorts, I have to admit that Batangas scores top marks! However, don’t just think that it’s only about miles of sand and turquoise blue waters, Batangas has so much more to offer both the culture lover (historical churches), nature lover (lakes in volcanos) and the epicurean (some outstanding local cuisine). In essence, there is something for everyone. We were there for mostly for the sand and seaside of things and specifically some scuba diving, so I headed for Eagle Point Beach and Dive Resort. Upon our arrival at Eagle Point Beach and Dive Resort, we were hospitably welcomed by the resort’s staff, greeted us with warm smiles and assisted us with our bookings. Checking-in was quick and we off to go to Sepoc Beach. Sepoc Beach is a small part of paradise on this earth and by small it’s kinda literal as it is only narrow and you can stroll from one side to another in a few minutes. Part of it is a beautiful white sandy beach looking towards Mindoro and the scuba diving is famous around the world. Sepoc Beach is found in this paradise on earth and if you’re into scuba diving or what to try, then this place is a must visit location. The coral reef extends along the north shore and is teaming with marine life and is also a great experience for those who simply want to snorkel rather than take on full scuba equipment. Sitting in the center is the beach center complete with an open-sided dining area and function area and bar good for about 60-100 guests, restroom facilities, a watchtower and a number of inviting native hammocks. There are also a number of nipa huts at the base of the hillside among the short stunted trees. Take note that the facility has no sleeping accommodations. To maintain its pristine beauty, camping and sleepover are not allowed. Sepoc Beach is also a great location for a company outing, team building venue etc and the nearby beach center can provide full facilities and a function area for up to 100 people with the exception of no overnight accommodation and this is prohibited to maintain the immaculate surroundings. For those less inclined to go swimming, you can get amazing views by climbing the not insubstantial hill or maybe explore several nearby coves. On the second day of our stay at this resort, we simply chilled and took full advantage of the great facilities at Eagle Point. They have 2 swimming pools, a dive center, spa, boutique, and souvenir shop, coral pool, game rooms and several function rooms which also makes it ideal for any corporate and social events. There is plenty of room for parking and even a helipad! Our room is located at the resort’s Anilao Batangas Terrace Hotel which is an amazing Mediterranean-inspired hotel overlooking the tranquil Balayan Bay. Designed for relaxation and adventure, the hotel offers an authentic lodging experience with a great deal of style. 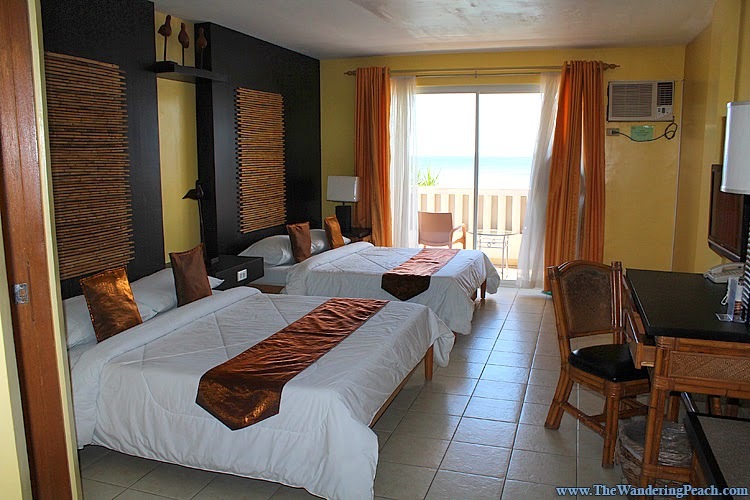 The hotel has 40 spacious and well-furnished rooms, 32 deluxe hotel terrace rooms with seaside balconies, and 8 superior rooms offering views of the jungle. All rooms are air-conditioned, with hot and cold bathroom and satellite TV, cabinets, a minibar with complimentary bottled water and a personal refrigerator. If you had to put your finger on an outstanding feature of Eagles Nest, it would have to be Bar and Resto which I am told was inspired by a traditional Samoan Longhouse and with its floor to ceiling windows, you are certainly indulged in fantastic views of the countryside and shimmering sea. The food is excellent, especially the seafood, and you are welcomed with a drink on your arrival by the friendly staff. It’s an amazing place to chill out, get fat and have a few drinks after a great days swimming, diving or just hiking. I highly recommend their plates of seafood especially the Fish Taco which we had for every meal. For those of you who have never tried scuba diving before and find the idea rather daunting and scary, fear not. I was with my sister and she had never tried before, although I had during a trip to Malaysia. She was scared on a number of levels; carrying a heavy tank on her back, losing air flow, eaten by fish etc, but the instructors at the resort are amazing. For only 1,680 pesos you can rent all the gear and get supervision. There are some basics to remember that is not difficult, like how to manage your goggles, how to breathe and communicate underwater etc, but you practice first in a fully protected reef pool which still has loads of fish to look at while you learn and gain courage. Believe me, it is an amazing and life-changing experience and one you simply must try or you will regret not having availed yourself of the opportunity and believe me, if my sister can, then so can you! Other than that, everything about the diving thing is SO MUCH FUN! You can’t go to Anilao without scuba diving!